Dubai, UAE, 12 April 2018: Al-Futtaim, one of the Al-Futtaim, one of the most diversified and progressive regional businesses in the Gulf region, announces its new lifestyle shopping destination in Jebel Ali, ‘Festival Plaza'. The name has been chosen in recognition of Al-Futtaim's successful ‘Festival City' Malls brand located across the MENA region, which is synonymous with quality shopping and lifestyle destinations, but with a clear differentiation. In line with Al-Futtaim's strategy for the Mall, it will serve as a convenient and welcoming lifestyle destination appealing in particular to the nearby communities including Jebel Ali, Dubai Marina and those commuting from Abu Dhabi. Following its ground-breaking in March 2017, the Mall is planned to open in Q4 2019. Festival Plaza will have a carefully selected retail mix to appeal to visitors looking for the best in lifestyle, home, food, hypermarket and entertainment brands. The two biggest announcements have been new concept stores for both IKEA and Al-Futtaim ACE - much demanded brands from Dubai South and greater Dubai customers. Celebrating the fast-paced urban lifestyle synonymous with Dubai, Al-Futtaim will take an exciting step into technologically advanced retail concepts. Festival Plaza will also be utilising signature services to offer a convenient and stress-free experience for visitors throughout their journey - from planning their trip via the website, valet parking, over 2000 parking spaces, digital wayfinding, free Wi-Fi access and home delivery services via IKEA. As part of Al-Futtaim's commitment to sustainable construction and operations, a state of the art building management system will be implemented with monitoring processes to ensure the asset is operated in the most efficient and optimal capacity. Aligning with the UAE's commitment to meet its energy and waste targets, the Mall is also designed to support the recycling of as much waste as possible. 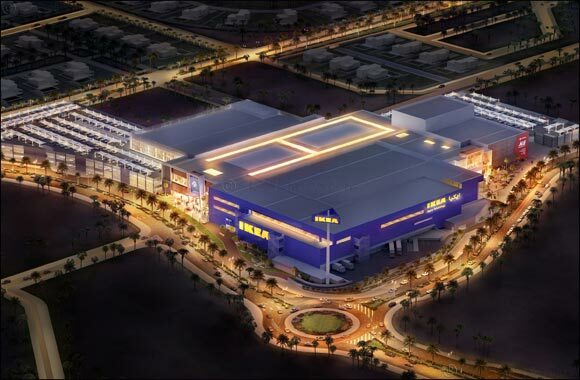 The new development will welcome Dubai's second IKEA, which will be the brand's newest concept store globally. The Plaza, with 64,800 sq. metres of leasable space, will in total host approximately 100 retail outlets, a food court and café-style dining, entertainment, a hypermarket and an Al-Futtaim ACE hardware store - all set to be completed Q4, 2019. The location of the new development will be inside wasl Gate, a masterplanned community accompanied by a lifestyle-oriented hospitality and entertainment offering, a world-class sports complex, K-12 schools with international curriculums, as well as a central park connecting the community's commercial and residential neighbourhoods. The location for Festival Plaza has been purposely chosen to be the closest Mall to the gateway between Abu Dhabi and Dubai, with ease of access from Sheikh Zayed Road and when completed the Mall will be only 700m from metro access – the Energy Metro Station.